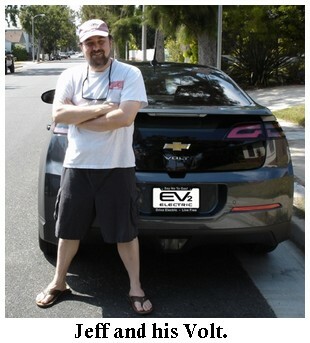 More of my interview with Jeff U'Ren about his Chevy Volt. This part is where we talk about what happened after he drove off the lot with his new baby. We talked about charging (where do you do it? ), insurance (do they charge you a arm and an leg?) and scheduled maintenance (oil changes? Really?). And...because I knew you'd want to know, I asked him whether Volts are 'real' electric cars or gas-guzzling posers (too rude? ), and if LEAF drivers give him grief at the charging station. You can find part one here. 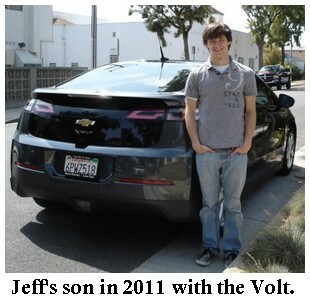 When did you get your Chevy Volt? Jan 2011. It was number 349. Interestingly, my EV-1 had been number 330 in that series. Did you order your Volt in advance, or pick it out at a dealership? Did you go to a Chevy dealer? 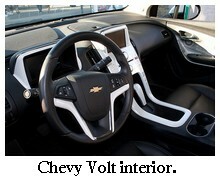 I kept an eye on the Volt, got on the email list to order it online, and I missed the window by one day. One day! And I kept thinking surely they'd extend the window, but they didn't. A friend of mine went to Rydell Chevrolet and got his Volt, and I talked to them to see if they had another one in stock, and they said actually yeah we do. Somebody ordered one and then didn't take it home. And it became yours. So you got your Volt, but you had to take whatever they had, right? You didn't get to pick the colors or anything. That turned out okay because the guy had ordered it exactly the way I would have wanted it anyway: fully loaded, and Cyber Gray. Did you do a trade-in, financing, all the usual car stuff when you got your Volt? I took a lease to keep monthly payments low; the lease payment is only $238 a month. They automatically rolled the federal incentive into the lease. The State of California also has a cash back incentive, and then there's a free clean-air sticker for HOV lane, and free parking in Santa Monica and other places. Are the insurance rates about the same as a gas-guzzler, did that change? It's a lot less, actually. My insurance rates are half of what the BMW was, because it's 5 star safety rated and has the OnStar system. So what's it like owning a Volt? Is it different than a gas guzzler? The Volt gets a tank of gas once a month. Some owners only fill up every 4 months. In fact, the gas savings alone from one Volt allowed me to buy a second one. It's a lot cheaper to operate. If everyone drove electric, the economy problem would be solved. Everyone could be putting all that gas money into something else. I've never had it in for maintenance. The technology tells you when something is wrong, there's no scheduled maintenance. Oil changes are done by usage. The tire pressure is also monitored. You get an email from OnStar once a month. It's built well; luxury everything, heated leather seats, great air conditioning. It's got its own phone. It's nice to be so connected; the onstar navigation helps you get where you're going, helps you find stuff you're looking for. I'm in the car a lot with my work, so this is really important to me. Wait. Your Volt has its own phone? Yeah. I use it for returning calls, emails, that sort of thing I can do in the car. My cell phone is bluetoothed to the car's phone. It's all hands-free. 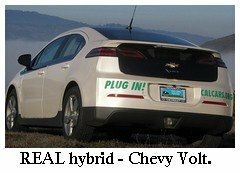 Are Chevy Volt owners "real" EV people? Do EV people give you grief about having a "less" electric car because it's range extended with a gas engine? No, there's not a lot of animosity. The ribbing is good-natured. They made a choice, they've drawn a line in the sand: NO gas. However, they have to rent a car or have a second car for longer trips. Everybody makes longer trips sometime, so you pretty much have to use gas for that. We all agree on the point that if you can plug your car in, you're in the club. What about at the charging station? Do you have to compete with the LEAF drivers for a spot at the charger? Not really. Sometimes a LEAF driver might feel entitled to use the public charger because they have to, but EV drivers tend to be pretty considerate of each other. Do you think of your Volt as an EV, or a plug-in hybrid? Electric. The only time the "hybrid" features kick in is on long trips or on the freeway. It's got 4 driving modes. The car performs the same in all modes, and the computer transitions for you between one and the next so you never really have to be involved with that. The generator comes on at 30% state of charge, and then it can also give you a boost of power on the freeway if needed. I average 288 mpg in L.A. traffic. I've gone up to San Francisco twice in the Volt. You can just drive it like any other car. On long trips I still get 41 mpg. How big is the battery pack, and how long does it take to charge? 16kw, and it uses about 10. With the 240v level 2 charger it takes about 3 hours to charge completely. Do you usually charge at home, or use public chargers? Do you have solar? At home, mostly. We've got two Volts now, so one of them uses the high speed charger inside while the other one has to use the 110 outlet in the driveway. We don't have solar, but we rarely spend more than 180 bucks for electricity in a month, including all that the house uses and also charging both Volts all the time. I have used public charging, but they tend to charge too much for the electricity so I avoid those for the most part. If I'm staying at a hotel out of town I'll use their outlet. They're always great about it, and usually let me charge for free. If they're reluctant, I just talk to them for a while, let them drive the car or whatever, and then they get excited about it and let me use all the electricity I want. I've found that the most powerful thing you can do to change someone's mind about electric cars is getting them to drive one. That's all it takes. It worked on me with the EV-1, and it works with everybody else, too. That's why I continue to do EV Ride and Drive events. Tell me about the interior space. Is it roomy? Have you ridden in the back seat? Yes, it's a 4-seater car, which wouldn't be my preference but that's what it is. I've ridden in the back seat a lot at Ride and Drive events. It's comfortable back there. It's a comfortable road car. The Volt is a mid-sized luxury car, not an econo-box like most of the other EVs and plug-ins out there. It's more comfortable than a Prius. It works well in cold weather. It's got really robust heating. With a gas engine on board, you know you'll never get stranded in the snow with no heat. Why do you think more people don't buy electric cars? For one thing, people are brand loyal. They're waiting for their preferred company to start building electric cars. And for another, it's a lot of money and fear of the unknown. And on the automakers' side, electric cars are being marketed as "other", which is a mistake. The advertising is ambivalent. They're reluctant to draw attention to the fact that they're building just one car that's so much better than all their other cars that it actually makes them look bad by comparison. Automakers should take some responsibility for all the harm they're doing, though. Gas burning cars are a dangerous product; as bad as cigarettes. Well, that's all the questions I have. Thanks, Jeff! Back to Electric Cars for Sale.